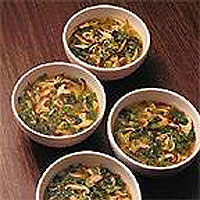 This healthy, simple, low-fat clear soup filled with mushrooms, pak choi and noodles would make a delicious start to a Chinese meal. Put the water, stock cube, soy sauce, ginger, chilli and lime juice in a large saucepan. Place over a medium heat and simmer for 5 minutes. Add the mushrooms and pak choi and cook for a further 5 minutes. Divide the noodles between four warmed soup bowls, top with the soup and garnish with chopped coriander.